In the 1850s, women’s petticoats alone could weigh 14 pounds. With the addition of foundation garments, bustles, multilayered skirts and bodices, a fashionable woman’s outfit could cross the 20-pound mark. In response, early feminists and social progressives began arguing for dress reform, and some daring women of the day donned bloomers and shorter skirts at the risk of arrest. 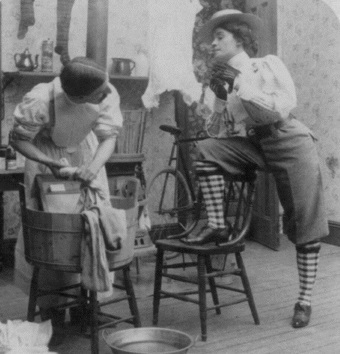 Even after women’s pants first entered high fashion in the 1910s thanks to influential French designer Paul Poiret, it took decades for trousers to trickle down into the daily wardrobes of American women. As late as World War II, women wearing “men’s pants” might be nabbed by police for violating anti-cross-dressing laws, demonstrating how fashion isn’t nearly as superficial as some might think.